Nothing stops me from SMILING; not a pair of ear muffs, and definitely not a broken tooth !! I'm a "live in the moment" kinda gal, I try to soak up everything in life and enjoy every moment of life!! 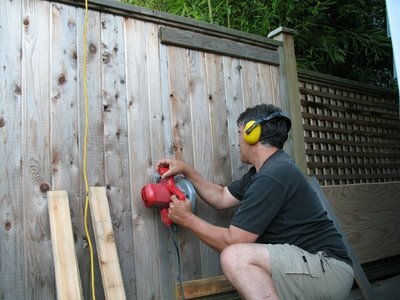 Today, mom and our next door neighbour, Malcolm (who is an excellent architect), decided to fix up the fence that I broke through the other night and add some reinforcement on other parts of the fence. 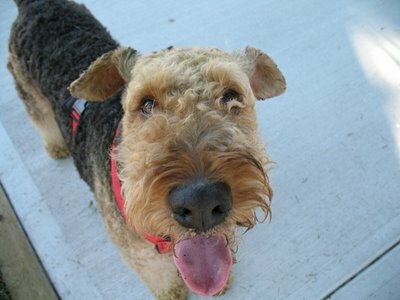 It's a great idea because, well, I'm a "terrier" who is built like a "tank", and I'm a "determined" being. 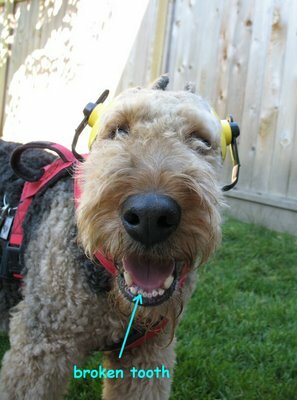 So when you put "terrier + tank + determination = lots of broken fences "
There was a lot of sawing involved today, and since I saw both mom and Malcolm had ear muffs on to protect their ears from the piercing noise, I brought up my concerns with mom. 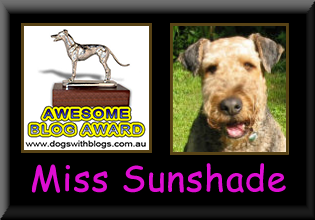 I mean, hoomans have "sub-standard" hearings as compared to us canines. So for them to feel the need to wear ear muffs, doesn't that mean I need to wear at least ten pairs of ear muffs?? 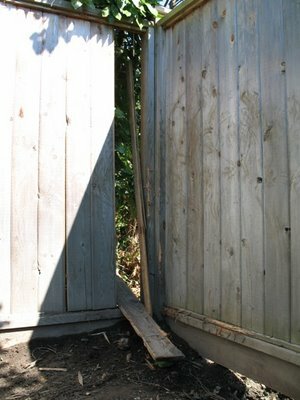 Mom gave it a long thought, and decided it would not be a good idea to argue with a terrier who had just broken through a sturdy, cedar fence. So off she went to look for the ear muffs. I was a little disappointed when she only came back with one pair since I requested ten! However, being the reasonable, cool headed girl that I am, I decided to let it go this time. It is now all fixed up, ready for more abuse!! 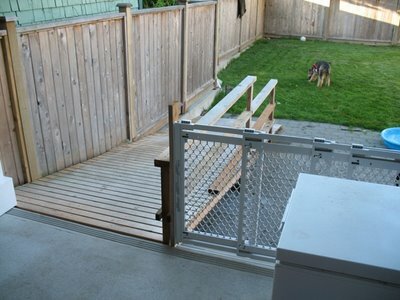 Mom and Malcolm also finished my ramp with the gate and all!! You see, I have had a bad elbow ever since I was 18 months old. 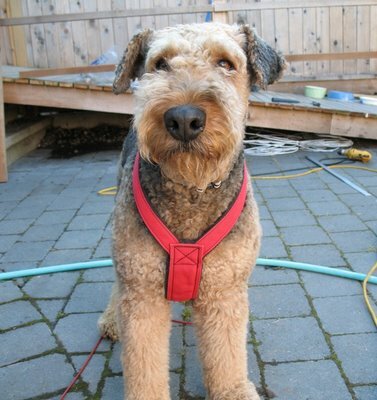 So mom tries to come up with ways to minimize impacts to my arthritic elbow, and this is just one of them. 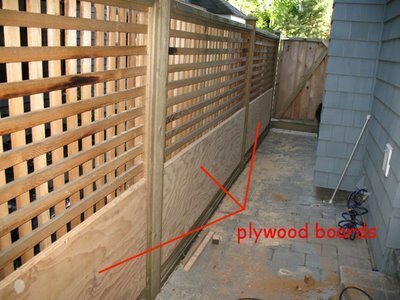 The theory behind this project is that, since I love to fly off my patio stairs (sometimes missing all the steps) to get after squirrels and etc, it would be ideal if the stairs were blocked off, and I have a gradual sloping ramp to run off of. 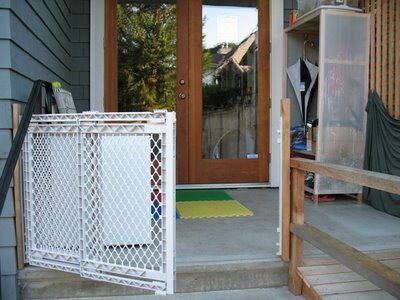 This is a gate that we put in to block off access to the stairs. It can, however, be swung open for those hooo-mans to walk up and down. 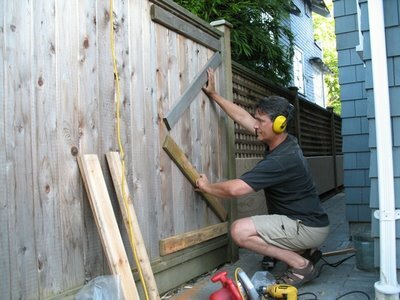 Lastly, Malcolm cut up a gate through the fence so that I can run from my yard into his yard to play and dig!! (Ok, that was a joke, Malcolm's wife, Rebekah does a lot of gardening, so doesn't matter how much I'd love to dig up her garden, I have to get control of my itchy toes!!) The main purpose of the gate is to make it more convenient for the hoo-mans to get to one another's house!! I am so happy my yard is all fixed up now! See, I'm SMILING again!! PS. mom and I would like to THANK all of you who suggested ways to keep the pesky raccoons away. We will be trying a few things in the near future. BTW, Butchy & Snickers, mom says she likes your mom's way the best considering what I had been through. Unfortunately, she doesn't think it is legal over here .... hehehe!! By the way, is that a pool I spied in the last picture? sunshade, you still look pretty even with a broken tooth. guess the only problem you have is less teeth to chew! wow, so much works have been done in a day. nice of your mom to get that ramp for you. wow ! That certainly looks like a huge project ! The good news is, you got NEW things to play in your yard :) I am sure you will find new places to dig and bite ... hahahaha ..
You're lucky to have such a great yard with a special ramp and pool!! You look cool with those earmuffs too. I can't even tell your tooth is broken when you smile. 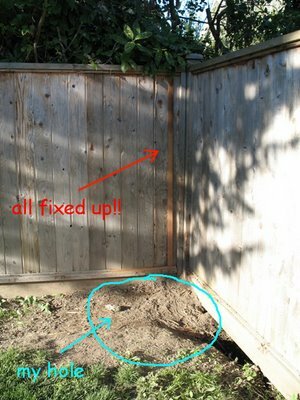 Wow, that is so nice of your neighbor to help your Mama fix up your backyard & fence for you. The ramp is especially nice!! We know what arthritic stuff is cause our Mama has it and she's always coming up with little things to help around the house too. 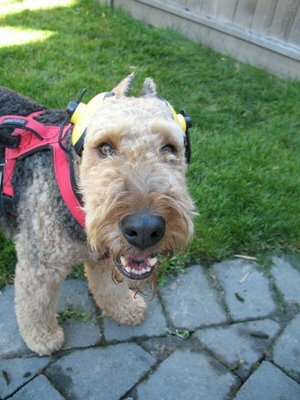 You look so cute with your ear muffs on! Very smart of your Mama to put those on you. 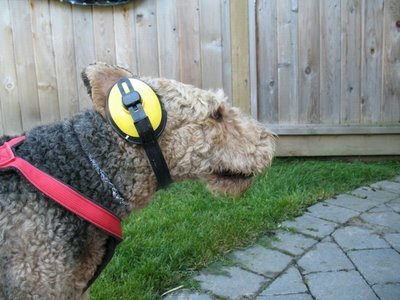 Have to protect your ears so you can hear those pesky raccoons when they are out in your yard, hehehehe! 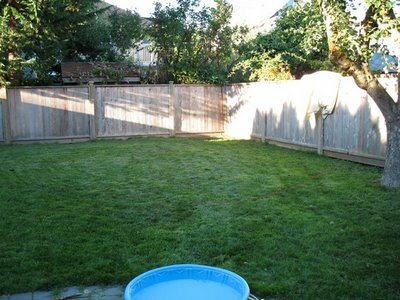 Wow, that is so nice of your neighbor to help your Mama fix up your backyard & fence for you.